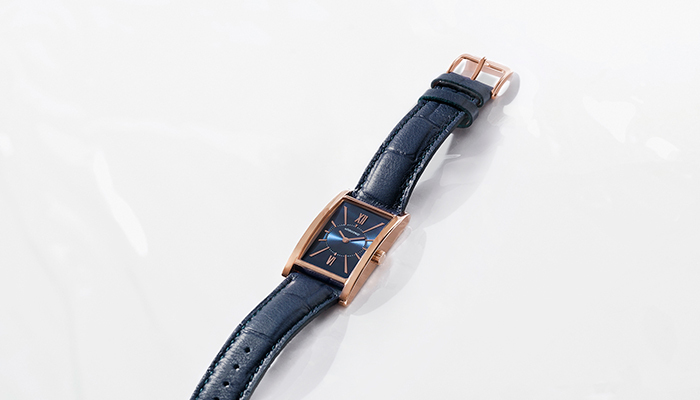 Le Marais watch with curved rectangular case in PVD* pink steel, round bezel, face in dark blue soleil colour with pink engraving and hands in pink steel. Rear cover with engraved logo. Dark blue crocodile effect leather strap, buckle clasp in pink steel and engraved logo. Japanese quartz movement with 5 ATM water resistance. *PVD: Titanium and gold coating through physical vapour deposition that gives the steel colour and resistance. This process allows the colour to be uniform and long-lasting.